When it comes to food, spring always makes me feel a little antsy. Because it seems like one particular characteristic of spring is the fleeting season of certain vegetables like fiddlehead ferns, fresh fava beans and ramps. When you see them, you must grab them, and it's possible that, if you're not keeping an eye out, you'll miss them all together. And I'm not one who appreciates being left out of anything. Ask my sister. In New York, the word at the farmers market is that ramps, having just shown up, are pretty much through for the season. Already and just like that. It's kind of stressful, actually. This whole business of getting your hands on things soon to disappear. This is why I never got into the beanie baby trend. I don't like to feel rushed. 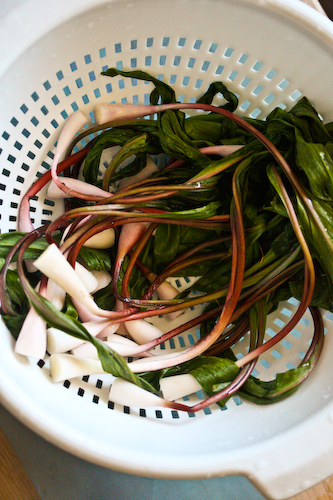 So the moral of this story is that if you see something like ramps, you must buy them with abandon, often with no plan in mind, and trust that you can use them to make something delicious. 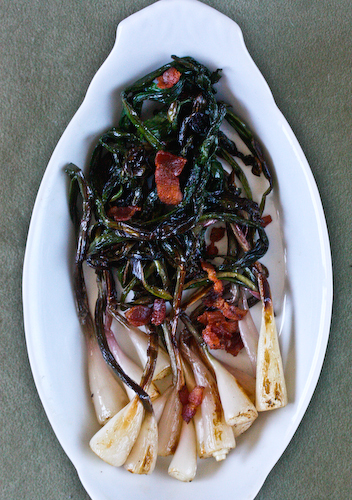 Which is pretty easy, really, because ramps are spectacular and their flavor shouldn't have to compete with much else. On that point, James Peterson and I are very much in agreement. 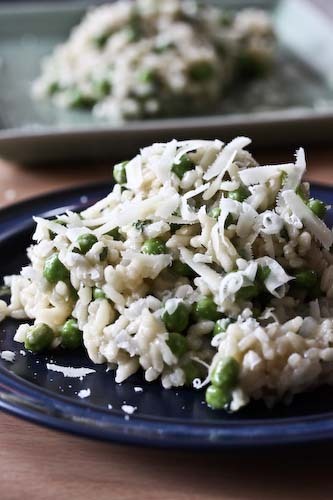 The other bonus is that this side dish is so easy and quick to put together and such a spring-time treat. So even if finding ramps is kind of stressful, preparing them definitely isn't. 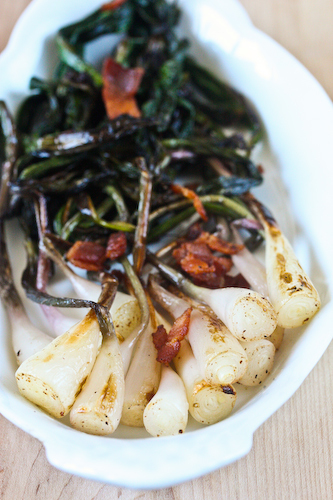 Peterson says that this is based on a method used in Appalachia, in which ramps are slow-simmered with bacon. Umm, bacon. And you use the whole ramp, onion-like white bulb, green leaves and all. For the ramps: trim the little root ends away, but cut only the smallest part off so the ramps don't fall apart. Run under cold water in a colander and rinse well to get the dirt off. Set aside. Cut the bacon into bacon-bits-sized pieces and cook in a skillet over medium heat. The bacon should turn crispy and render most of its fat. Peterson suggests 8 minutes, but I like my bacon pretty crispy, so I went for closer to 13. Remove the bacon from the pan with a slotted spoon and place on a paper towel to drain. Add the ramps to the bacon fat and cook, gently stirring occasionally, over medium heat. 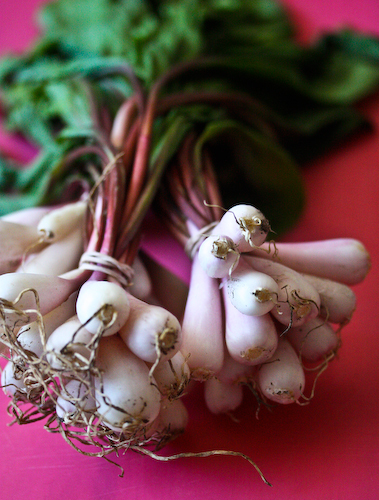 You want the ramps to soften and for their raw bite to mellow. Again, Paterson suggests a slightly shorter cook time, 6 minutes, whereas I cooked them for about 9. I like the way the longer cook-time dries the greens out a bit and makes them crunchy, and I found the white ends better mellowed after a slightly longer amount of time in the pan. Add the bacon back in, give it a stir, and season with salt and pepper before serving. I feel the same way about spring produce! Well said. Our farmers' markets don't carry ramps, but this sounds seriously delicious - I love the simplicity. I've never tried tramps either. We're headed into summer here so I probably won't. They're definitely in my, "try before I die" list though. Now this looks wonderful! Anything with bacon...I just tested a chicken with ramps recipe that didn't let the ramps shine through at all. So disappointing, and they'll be gone so soon! Like a match made in heaven!! I want this immediately!